This design may look familiar to some of you. A similar piece, In the White Room, was created by the same designer and contains a similar construction. In the White Room has been a very popular piece, having been exhibited twice at Cooper Hewitt, and reproduced in numerous publications and blogs. 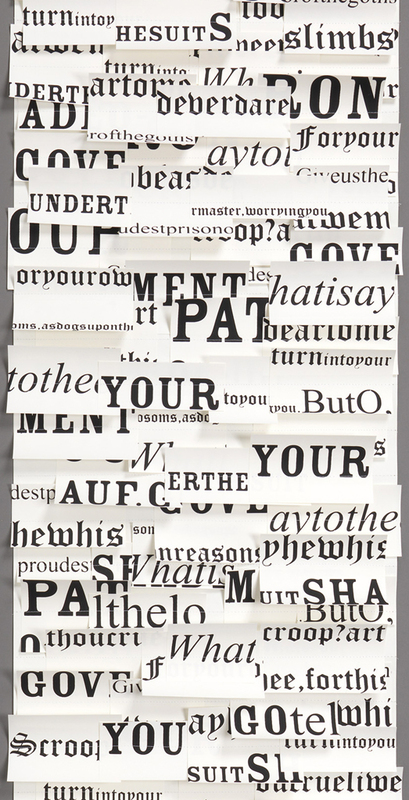 White Room with Text takes Tracy Kendall’s signature cut-and-sewn construction one step further with the addition of text. The text was selected from the writings of Shakespeare and is printed in black on a white paper stock. The words and word fragments are printed in a variety of fonts and point sizes, with some containing all upper case letters, others all lower case, and some in italics. The changing scale and weight of the type creates a false perspective that wreaks havoc with the true relief of the curled paper. The play of these two elements creates a visually stimulating design and keeps your eyes moving across the surface of the design, trying to find meaning. Kendall began her wallpaper career in 1996, screen printing large-scale designs of feathers, plants, and cutlery. These panels could be used alone or in groups and stood over seven feet tall. Her bespoke line of three-dimensional wallcoverings followed and includes this design as well as papers with projecting sequins, jigsaw puzzle pieces, buttons, and fringe. Kendall’s bespoke wallpapers are almost all light in color, which allows for the most dramatic play of light and shadow. Even given this fact, any of Kendall’s designs would add an element of drama to a room and are sure to be noticed.